I wish there was something I could do to help some people relieve the stress of Christmas. I do my part for needy families and charities, but I’m talking about everyday people like you and me who seem to get over-whelmed this time of year. From co-workers to friends, you hear about the ‘stresses’ of Christmas and the pressure to get the hottest most expensive items. What if everyone made it a point to bring Christmas back to a simpler time. Case in point. When we were young we were given a few gifts, which included pajamas, one toy of choice, socks and a few other goodies. I would never dream of asking my parents for a computer or anything that cost in the range of $700. In our stockings we received an apple, and orange, some candy canes and a choclate Santa. My favorite part was the 5-point apples (as my dad used to call them). The Red Delicious apples that my mom and dad only bought once per year. It was my favorite part of the stocking. There were no $200 mp-3 players in our stockings, our total gifts didn’t come to $200. We just didn’t have it. And the thing is, we weren’t poor, we were middle class. and I know our salaries have not increased by 500%, so why has our spending for this season increased by 500%? It’s up to each and every one of us to simplify this holiday again. Enjoy it…please! I have just finished reading both of Michael J Fox’s books, Lucky Man and Always Looking Up. I enjoy autobiographies very much, and these are two of my favorites. 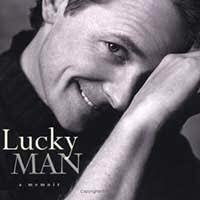 The first book, Lucky Man, tells of his rise to fame to his diagnosis with Parkinson’s Disease. It is well written, funny, sad and poignant. In his own words he tells of his struggles and triumphs. A great book, worth passing on. The second book, Always Looking Up – The Adventures of an Incurable Optimist focuses on the last 10 years of his life, as he retires from acting, starts a Foundation and starts his journey to help find a cure for Parkinson’s Disease. As with the first book, it is well written, and I found myself going to YouTube and watching the interviews that were mentioned in the book. Especially the one with Katie Couric. These would be great gifts for people, as they are inspiring, funny and thoughtful.